While a balanced diet provides adequate nutrition for most healthy people, dietary supplements may be helpful for individuals who restrict calories for weight loss or follow a restricted diet. Others that may benefit include older adults and those with conditions that inhibit nutrient absorption. Are There Vitamins You Shouldn't Take Together? The vitamins you need for healthy function include vitamins C and D, vitamins A, E, K and the B vitamins. Multivitamins often include most or all of the 13 vitamins essential to optimum health. However, in certain circumstances, some vitamins you shouldn't take together. These vitamins may impact the effectiveness of others when taken together. You don't need to worry too much about interactions between vitamins if you're taking a multivitamin and eating a fairly healthy diet. But when taking individual supplements, such as niacin or vitamin K, you may need to be cautious about potential interactions with other nutrients. In terms of meeting basic nutritional needs, taking a multivitamin that includes niacin, or vitamin B-3, is safe in combination with other nutrients. However, if you take niacin supplements to help control your cholesterol, certain combinations should be avoided. Vitamin A as beta-carotene, and vitamins C and E may reduce niacin's ability to improve good cholesterol levels. One of the B vitamins, folate may be included in B complex vitamins and in multivitamins containing vitamin B-12. While taking folate and vitamin B-12 at the same time is not problematic in general, folate can mask a B-12 deficiency. Older adults, strict vegetarians and people with gastrointestinal disorders are at increased risk of vitamin B-12 deficiency. Low levels of vitamin B-12 can lead to anemia, a condition that folate may help correct. However, if the underlying B-12 deficiency is not addressed and corrected, permanent nerve damage can still result. If you are at risk of B-12 deficiency, seek your doctor's advice regarding proper supplementation. Vitamin K plays a central role in your body's ability to properly form blood clots. 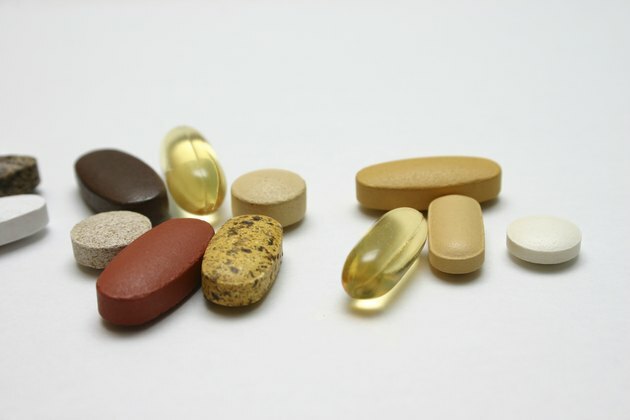 If your doctor recommends a vitamin K supplement, avoid taking high dosages of vitamin E or vitamin A, which may counteract the effects of vitamin K. Additionally, if your blood clots too easily or quickly, your doctor may recommend avoiding vitamin K supplements and keeping food sources of vitamin K at a consistent level. Follow your doctor's advice about supplementation if you take blood thinning medication. Anemia is a medical condition in which your blood can't make enough red blood cells. Iron-deficiency anemia is the most common type of anemia and develops when you're not getting enough iron-rich foods. A blood test can determine if your anemic and whether it's related to your iron intake and stores. If the cause is low iron levels, you can increase your iron levels through iron rich foods, including beef and other meats, beans, lentils, dark green leafy vegetables and dried fruit. To kickstart your iron levels, however, you need to also add a supplement. Iron supplements are best absorbed when taken on an empty stomach, but can also cause stomach upset. If you're having difficulty tolerating your iron supplement, you may want to take it with a meal or snack. Don't, however, eat dairy products or take calcium supplements within two hours of taking iron supplements. The calcium prevents your body from absorbing the iron. Wait at least two hours after eating these foods before taking iron supplements. Also, avoid eating high fiber foods, raw vegetables and bran when you take iron. Dietary supplements vary in the nutrients they provide, as well as in the dosage of included nutrients. If you opt to take multivitamins, MayoClinic.com recommends choosing one that provides no more than 100 percent of the daily value of each nutrient. If your doctor prescribes a dosage higher than the daily value of a particular nutrient, disclose any other vitamin and herbal supplements that you take so that problematic combinations can be avoided. How Much Vitamin B Complex Should a Person Take in a Day?